Innocent and fresh with lovely energy. 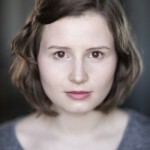 A rising star of stage and screen with superb credits. Great ear for accents too. American accent is flawless.